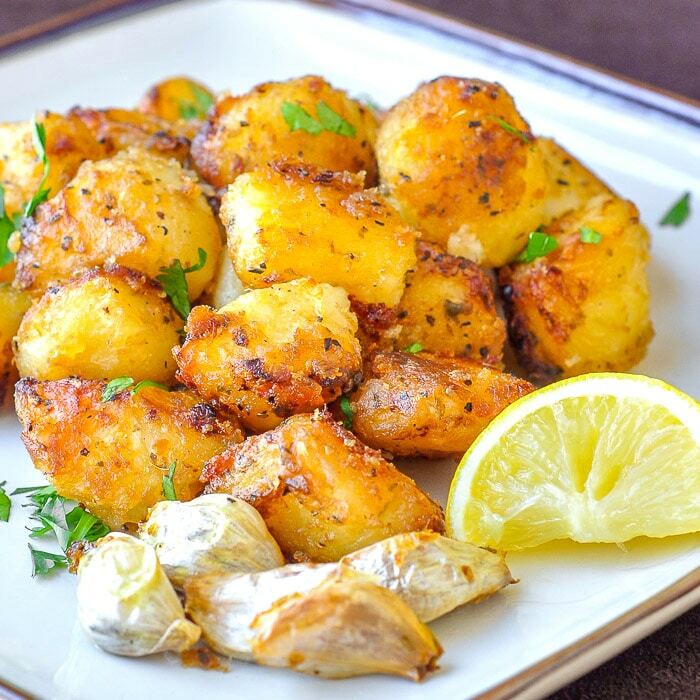 Lemon Herb Roasted Potatoes - easy, flavourful & super crispy. Perfect! Roasted potatoes are pretty much a family institution at our house. Now these flavourful potato nuggets have become a new favourite. I first started making them about 10 years ago when I saw Jamie Oliver make them. I describe them as an absolute must for a British roast dinner of any sort. You can read more about how to make The Perfect Roast Potato here. This variation simply takes the same method and adds lemon and herbs. We enjoyed these potatoes at our Sunday dinner last weekend along with a whole, beautifully roasted Lemon Dijon Chicken. 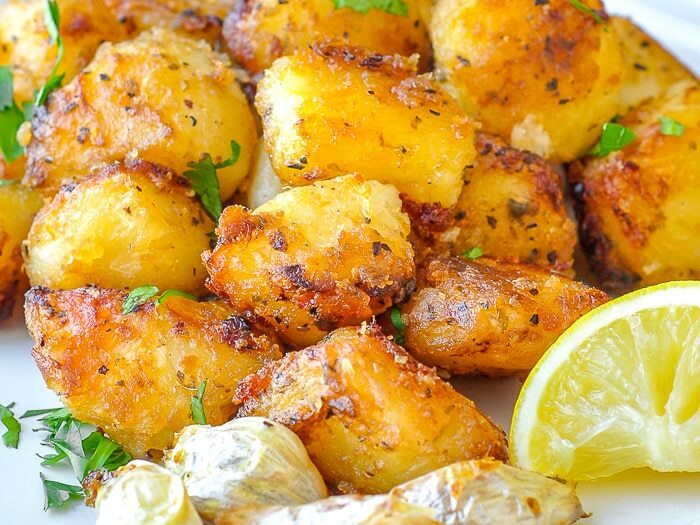 Like this Lemon Herb Roasted Potatoes recipe? 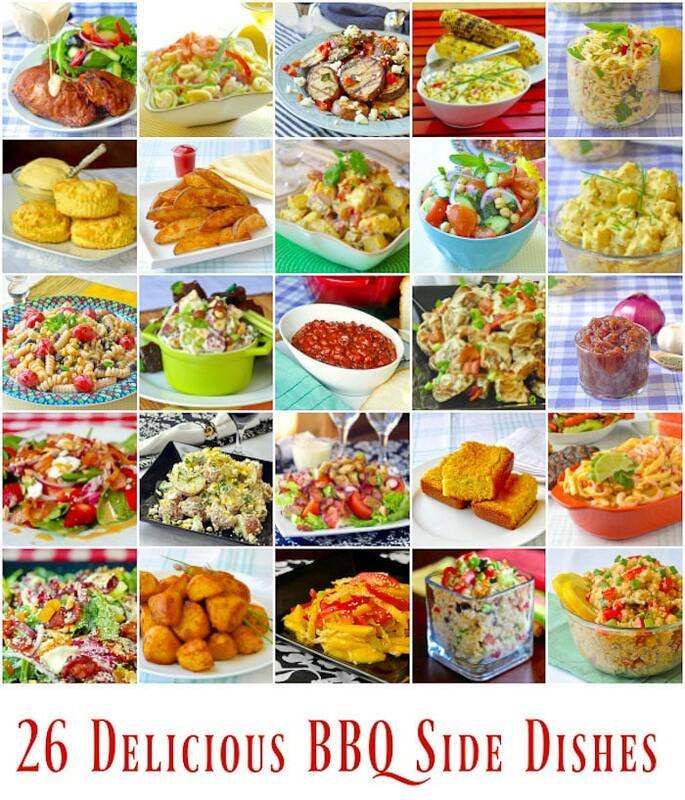 Find plenty of other delicious ideas like this in our Side Dishes Category. You may also like to try our Barbecue Spice Roasted Potatoes. Perfect with everything from the summer grill… Or a welcome reminder of summer flavours any time during the year. Our family just loves them! 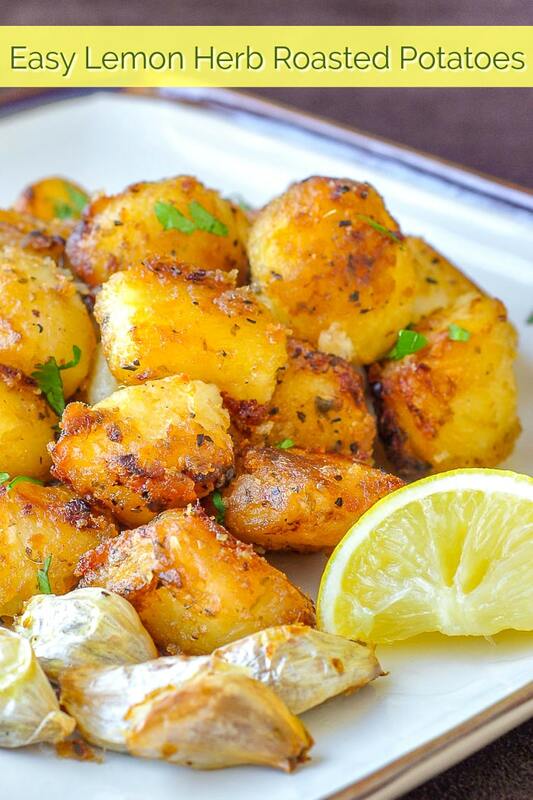 These Lemon Herb Roasted Potato Nuggets are a terrific side dish with many meals like any roast chicken or lamb dinner or to serve with Greek Souvlaki. I’ve been following Jamie Oliver’s method for roasted potatoes for a few years now too. They are fabulous! Crisp outside, perfect inside! I have all of those ingredients – I can make this tonight! I’m making this tonight for dinner, but I have a question. Can I use parchment paper on the baking pan? I always line my pans with parchment when I cook. I use parchment paper a lot too but not in this case. You need to heat your pan first and they don’t stick when you do that properly. The parchment paper may soak up the oil too. I was wondering how well these would crisp if I were to use an electric skillet. Living in Florida, I try not to use the oven as often as possible as it heats the house up so quickly. You can try it but this recipe really is meant to be roasted to get that beautifully crispy exterior. I love my electric skillet for potatoes! Get the oil really hot! You do have to turn them!!! I hate using my oven when it is hot too. I recommend one of the halogen heat/ convection ovens. They heat up much faster, use less energy, and they don’t heat up the house. With minor adjustments, they will do anything a big oven will do. They are cut into large potato nuggets, not diced small like hashbrowns. These look delicious! Do you peel the garlic or just mix it in with skins on? If so, does the garlic somehow flavor the potatoes? Just curious as I’ve never done anything like this. Thanks! I like to eat the roasted garlic with the potatoes and sour cream. Heaven!…if you like roasted garlic. I’m pretty sure she was asking if you peel the garlic prior to roasting, as it seems odd it would flavor the potatoes with the skins on. I was actually wondering myself, yet the picture shows the skin still on, which seems strange. The peels pop open to release flavour but they are needed or else the garlic will burn and get too bitter. Made these tonight and while the flavor was good, the crisp wasn’t there. They were just okay, nothing special. Sounds like you used the wrong potatoes or didn’t cook them long enough. As you can tell by the pic, they’re crisp when I cook them. My potatoes did not turn out nearly as textured and crispy and I had them in for nearly an hour and a half. How can I make sure to get this same texture? Sounds like an issue with the type of potatoes to me. Unsure about the instructions re preparing the garlic…do you peel the garlic? I have never had roasted garlic. Garlic is roasted with the peel on. I just tried this recipe and the potatoes came out gorgeous!! Crispy thin outside, very tender and soft in the inside. I will never make potatoes any other way!!! I liked this lemon flavor but what was really amazing was the CRUNCH that this cooking method yielded. It is what I am always trying to attain but never have been able to till now with roasted potatoes. They even reheat well. Thank you, thank you, THANK YOU! I just made them and the taste was incredible!!!! I can’t wait to make them again! thank you for the recipe!!! I can’t wait to make these. I have all the ingredients ready. One question though. “par boil” the potatoes. When I think par-boil I think water boiling and drop the veggie in, but with potatoes I assume they are in the water as it is brought up to boil. So do you put them in cold water and once it’s boiling set the timer for 3-4 minutes? or drop them in water already boiling for 3-4 minutes. I let the water boil first. I also have the potatoes in hot tap water while the pot boils. Then drop in the spuds, wait for them to come up to boiling again and start timing. these look awesome! Have you ever made them in bulk and freeze? If so, how did you reheat them? Looks very good, will have to try it. I am making these today…I only have red potatoes…do these really not turn it if they are not russet potatoes? Russet potatoes will be far crispier. These came out great. They have awesome flavor and are so crispy! 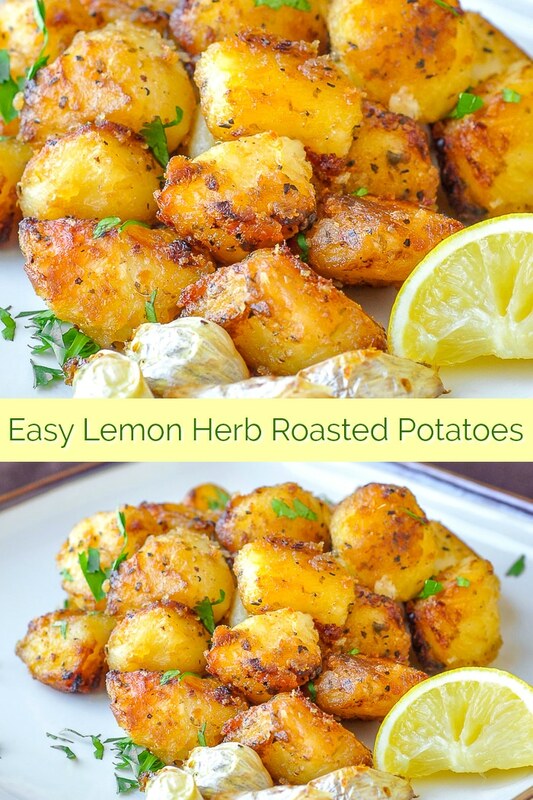 I have made roasted potatoes before, just not with lemon juice and these herbs. I can’t wait to try this alternative!! And the way I learned was after par-boiling the potatoes, to use a cookie sheet,pour some oil on it then put the potatoes on it,turning them to coat them all over then baking them. But either way, roasted potatoes are a wonderful dish!!!! The instructions do not indicate whether you need to peel the potatoes. Please advise. Thank you! The ingredients note that the potatoes are peeled. When fixing this recipe, do you use all 3 herbs or just 1 of the 3? The Greeks have cooked potatoes this way for generations. Always use EVOO. When do you peel and cut the potatoes? I tried it, my only addition is little sweet paprika for colour and taste…. Omg, i can’t really tell you how delicious it was, me and my kids all enjoy…. Serve with Ketchup and Mayo… Wow.. When you make the kids happy, you know it’s a hot. Thanks for sharing your success. Have you ever used the tiny potatoes and cut in half? These of course would not get peeled. Would they work? Also – have you tried using the minced garlic in the jar and just adding at the beginning when they go in the oven? Minced garlic will burn in the cooking time. Using unpeeled potatoes is different altogether in terms of crispy potatoes. Hi! I can’t wait to try these potatoes! They look fabulous. I was wondering if I should spray the metal pan with cooking spray…do you ever use parchment paper? Or, is heating the pan sufficient in keeping them from sticking? Thanks for your help! The oil and potatoes on a hot pan are all that’s needed. Just give the pan a shake after 10 minutes or so in the oven to make sure they are moving well on the pan. Thank you so much! We had these last night with lamb chops. The lemon flavor was just perfect, and I had an excuse to use my herb garden. Thanks also for the tip about pre-heating the pan; I never knew this helped with the potatoes not sticking – it worked like a charm. Not really. Roasted potatoes are not as good reheated. We do make hash browns from the leftovers sometimes though. OMG. OMG. OMG. These are the most delicious potatoes I have ever had! and I LOOOOVVE me some potatoes!! HA! 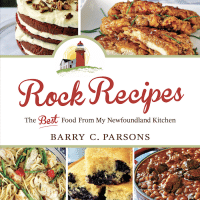 I get that a lot about this recipe! This recipe looks amazing. I cannot wait to try it. Has anyone tried to do this recipe on the BBQ? With summer coming, was wondering if it would work on the BBQ. Might be an issue there. But on a pan with the lid down….maybe I’d try.